Ok. Let’s get this out of the way right now; who wouldn’t want a Matt?? He is over 6 feet, 270 lbs of solid muscle. He comes from a large family of siblings. He is a Navy SEAL (a military man, YES). He likes kids and he is very responsible, he has a take charge attitude with a lot of love mixed in. I mean he is on leave at the beach and can have any women he wants and picks a pregnant woman with four small children! Matt is a big guy with a big heart! Book Boyfriend material! Abby has trust issues. Rightly so. She was abandoned by her mother (you will have to read how in the book, but I get it) after her father died. She was placed in several foster care homes. Her husband found more time for work traveling than with his family and died 6 months ago in a plane crash. She has no other family. When the two meet, Abby is a little cold. But her son is intrigued by Matt and Matt plays with him. Then they are all hanging out for the whole week going everywhere together. At the end of the week, Matt kisses her and wants to continue a relationship with her. Abby doesn’t want to; she thinks he won’t come back. They never do in her mind with her life’s history. But she can’t deny the attraction and he likes her kids. Matt comes to her several times between assignments and Abby’s kids become quiet attached. Annie (Abby’s oldest child) is more hesitant. She is less trusting like her mom that he won’t be there for them. Matt adores her growing belly. Matt finally gets them to come to his family’s home for Thanksgiving and he wants her forever. But all stories have an obstacle. Between Abby’s lack of faith in people and her finally letting her heart go to him and Matt’s feeling of responsibility, something happens. That’s where I really fell in love with the story. What Abby learns about her husband and herself is what had me in tears. In that one moment, Abby gets it and overcomes her own obstacles and forever alters not only her life but other’s as well. Was there anything I didn't like? NO! If you like Navy SEAL, military men, families (especially large ones), overcoming your own obstacles to trust and have faith in people, finding love, books with kids in them, doing the right thing, the beach, than this book might be for you. It certainly did it for me! I will be following this series and checking out more from this author! There were several songs that I really “felt” at different points in the book, like a movie soundtrack. I won’t tell the scene they go with, but I’ll list them in order. It won’t be hard for readers to figure out. Ooh! That would be a fun game! 1. All The Stars ~ Ed Sheeran and Christina Grimmie. 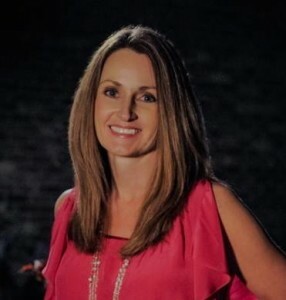 Claudia Connor attended Auburn University, where she received her undergraduate and masters degrees in early childhood education, and completed her studies in Sawbridgeworth, England. After years of making up stories in her head, she finally decided to try writing them down when a friend told her oh, so kindly, that talking to imaginary people was in fact NOT normal. Always a lover of happy endings, she enjoys movies, reading, and travel, but spends most of her time these days putting the stories in her head on paper. 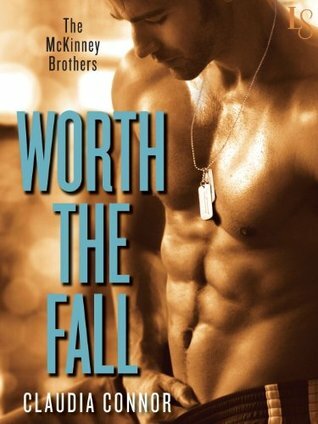 Worth the Fall is the first book in The McKinney Brothers trilogy. The second book, Worth the Risk, is set to be released in January 2015. Claudia lives near Memphis, Tennessee, with her husband and three daughters. For more information on her books or just to say hello, drop by her Facebook page.